Chef Ryan McGuire-Common Roots Project founder. Executive Chef of the Executive Mansion of North Carolina. Making connections with people has always been an interest of Chef McGuire’s which is what inspired his motivation towards achieving his BA in Public Communications from SUNY Buffalo. While in school Chef McGuire worked in various facets of the foodservice industry and once completing his degree he came to the realization that cooking was something he was extremely passionate about and decided to pursue these passions further by attending the Institute of Culinary Education in Manhattan. This combination of Public communications along with his work experience in the Culinary field has provided the perfect backdrop for the work he’s accomplished most recently. Currently, McGuire’s working as the Chef of the Executive Mansion of North Carolina. 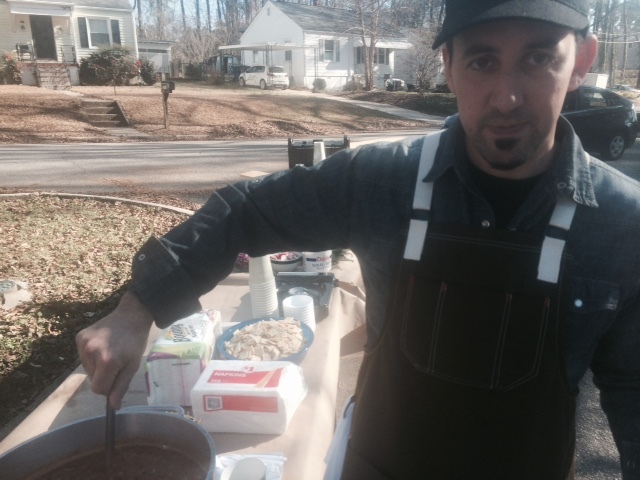 He’s previously worked as a Chef Instructor at The Chef’s Academy in Morrisville, North Carolina and has worked closely with Child Nutrition departments of public school systems by creating a culinary training program for cafeteria associates (https://homebasecooking.wordpress.com/). He has also been contracted to work on grants in conjunction with UNC’s Public School of Health, the US Virgin Islands and Chapel Hill Public School systems. Chef McGuire’s work portfolio includes a few landmark restaurants in NYC such as Bobby Flay’s Mesa Grill, Union Square Hospitality groups Blue Smoke and Gramercy Tavern. He learned more of an appreciation for what it takes to get food to the table and more about organic farming principles from the work he did as a Chef at the Virgin Island Sustainable Farm Institute, providing farm to table meals for guests and farm workers. Having the opportunity to work some great events such as the Charleston Food and Wine Festival, The South Beach Food and Wine Festival as well as Blue Smoke’s world famous Big Apple Barbecue Block Party he grew a great passion for American cuisine. In North Carolina, Chef McGuire has worked with the likes of Chef Amy Tournquist of Watts Grocery where much emphasis was placed on local produce and traditional Southern Styled cooking. While in Durham, Chef McGuire also worked at Magnolia Grill with James Beard Award-winning Chef Ben Barker. Prev Meet Kim Hunter, Chef/Owner of Kimbap Raleigh. Fresh, local, Organic Korean-inspired Cuisine.